What an amazing time we had at this month’s storytime! We read five books that all kept the attention of the children and parents. Afterwards, the kids used sparkles, stickers, glitter, and jewels to decorate their frames. At the suggestion of one of our Chocolate Storytime mom, Ms. Sabrina, we took pictures of the kids faces inside of their frames. Visit the Photo Albums to see their smiling framed faces. My Shoelaces are Hard to Tie! What a fun book to read! The kids liked this story because they could all relate to learning how to tie their shoes. 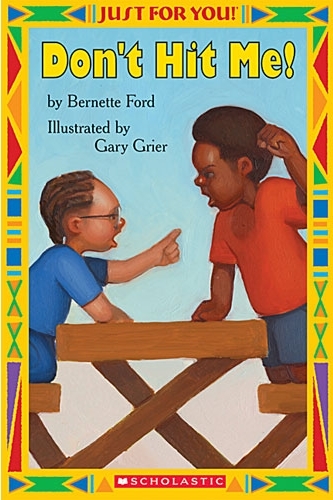 The illustrator nicely depicted the girl’s cornrows and baby hair. Most of the kids already knew how to tie their shoes and enjoyed predicting what would happen next. The rhyming makes it fun to read aloud. In the back there are activity ideas and fun vocabulary clarification. Using repetition, rhyme, and rhythm, this poem was very nice to read aloud. 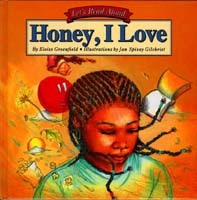 It uses simple yet descriptive language and captures the essence of what a lot of little ones love. It It reminds me of the hot summers we used to spend on the east cost–going from my maternal Aunt Ruth’s house in the city of Washington D.C. to our paternal great aunt’s house in the Virginia country. My daughter hasn’t had that experience yet, but can truly relate to the last two pages about loving mama’s softness and warmth and not wanting to go to sleep at bedtime. This was my favorite book! A cute books that encourages reading. Lola has a baby brother named Leo who gets into all sorts of mischief. 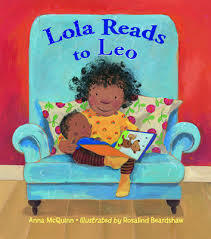 Lola demonstrates her caring and responsible big sister skills by reading to Leo. 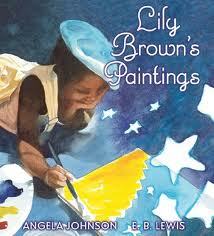 When Lily Brown paints, takes her to a different place. We traveled with her imagination through her artistic journey that made the trees talk and people walk upside down. The children knew that Lily Brown entered into a land of make believe and pointed out the things that could only make sense in the mind of an artist. This title was unanimously chosen by the children. It’s a good book about using your words instead of your fists and about forgiveness. The children seem to have been captivated by the facial expressions of the two characters throughout the book. You can check these books out at the library or buy them online. Previous Previous post: Three More Dates Added!